RUSH: Let’s go to the audio sound bites. This is more media shock and disbelief. We had examples of it yesterday, and we have two more. Audio sound bites, 1 and 14. First, “Christiamanpour.” It’s actually Christiane Amanpour. You have to say that almost as one word, Christiane Amanpour. You don’t know where the first name ends and the second name begins. It’s kind of like Joe Montana, just one word: “Jomontana.” “Christiamanpour.” She’s on CNN’s New Day. She’s now the chief international correspondent, and she’s reacting to the reaction Trump got in Davos. AMANPOUR: We have never, ever, ever seen — and we’ve been covering Davos for years — a trumpet orchestra, a trumpet ovation opening the speech of any leader, even the president of the United States. And obviously President Trump is the first since Clinton back in 2000. But, nonetheless, that never happened before. There’s no doubt that the Davos crowd loves the corporate tax cuts, loves the stock market, loves the fact that the economy’s doing well. Most will say that the U.S. economy is building on the Obama years, building out of where it was going since the financial crash. But nonetheless, they love the economy and the facts and figures. RUSH: Christiane… None are gonna say that, Christiane. In your dreamland are they gonna. Nobody’s saying… Obama didn’t even go to Davos because he wasn’t going to be given this kind of treatment! If any of you doubt this, Obama would have been there every year if he thought he was going to be welcomed like Trump was, with trumpets and orchestras and being treated like a rock star. But Obama didn’t go because he knew he wouldn’t be because Obama wasn’t doing anything for economic growth anywhere. Obama was retarding economic growth in the United States, which retards economic growth around the world. At least in our allied nations, the Western democracies and so forth. Not so much the ChiComs. But Obama was… What is this, “Most will say the U.S. economy is building on the Obama years”? There’s nothing in the Obama years to build on, Christiane Amanpour! Build on what? This is pure, 100% tax cuts. Building on the…? This is how weak these people are. This is so, so transparent. Here now our old buddy Jim Acosta at CNN. These people are shaken, my friends. They are shaken to their core by what they’ve seen in Davos. 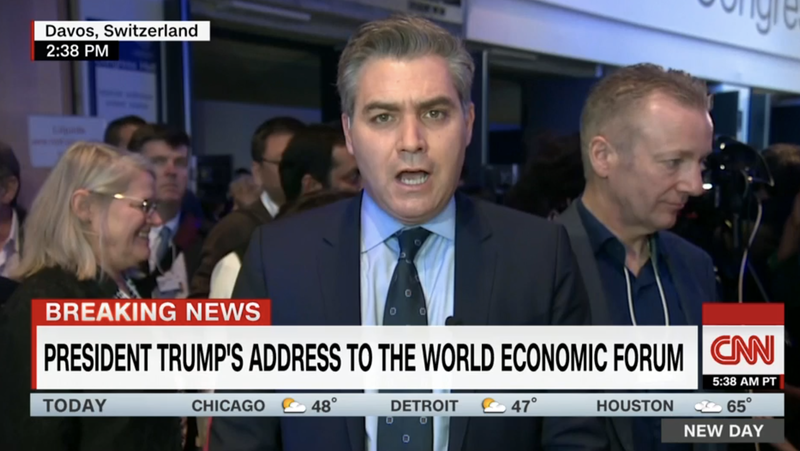 ACOSTA: He’s had a pretty good reception here in Davos, uh, for somebody who railed against globalism as a candidate for president. He has been mixing and mingling with these fat cats and bigwigs nonstop, uh, ever since he’s been on the ground here in Davos, and he’s had a pretty f-friendly reception. I will say, though, it was rather remarkable to hear the founder of this World Economic Forum, uh, also take jabs, uh, at the press and say that the president, uh, is the victim of biased interpretations and misconceptions. All in all, that was a fairly pitiful display. ACOSTA: That’s the environment we live in with President Trump. It was fascinating to watch the president get this reception here in Davos. Not what I expected. RUSH: Yeah, of course, Jim, because you’re not tuned in to what’s really going on! You’re so far out of it, you don’t know you’re in it. So the leader of the World Economic Forum also decide to jump in and start ripping the press because Trump has given them permission to do it and he’s seen that you can prosper by doing it. But this raises an interesting point — and I’ll tell you why Acosta’s really bad. I’ll tell you why when we get back. RUSH: Okay. Here’s one of the reasons why Jim Acosta — and he’s not the only media guy upset. So he says here, “It was rather remarkable to hear the founder of the forum take jabs at the press and say that Trump is the victim of biased interpretations and misconceptions. That was a fairly pitiful display. That’s the environment we live in with President Trump.” So Trump has encouraged these guys to follow their instincts. You think these guys like the media? We’re talking about CEO types. They don’t really like the media. But here’s what Davos is for the media, from their standpoint. The media, particularly in this country, thinks that they are in the same class as the people they cover — the same stature, the same socioeconomic class — and going to Davos where the media is oftentimes a bunch of sycophants, it’s all about them thinking they are as important and relevant. They are part of the same club that the gazillionaires are in, and that’s one of the reasons they all like to go. No class consciousness for that week. RUSH: The media, folks — and this is due to the fact that they consider themselves really, really important because they have constitutional recognition, their jobs, their responsibility. So their self-importance is off the charts. They consider themselves to be in the same class as the people they cover. And in many cases, they think they’re in a bigger, higher class, that they’re upper class — socioeconomic stature, you name it. You have an event like Davos where it is the world’s elite in terms of wealth, the world’s elite in terms of power, and the media loves going to these things. Do you know why? Because there is no class consciousness at these things, and by that I mean the media is allowed to think they walk on the same ground, they trod the same halls, they’re held in the same esteem. They really believe that they are as important as the people they’re covering. They are as important as leaders of countries. They are as important as big time CEOs. And when they go to Davos, it’s all one group partying, and the media (in their minds) is treated accordingly. They’re not treated like an underclass that is only permitted in for a few moments each day and then sent packing and they have to watch through the glass windows what’s going on. They’re let in. So when this founder and leader of the World Economic Forum in Davos starts praising Trump, defending Trump, and saying that Trump is treated unfairly by the media, Jim Acosta loses it, because he’s being talked down to now. He thinks he is as important as the guy running the World Economic Forum in Davos, maybe more important — and he’s not the only one. They all do. This is why they can’t believe what they’re seeing with Trump being treated the way he is, like a rock star with all this respect. They think if anybody should be treated that way, it’d be them. They’re saving America from Trump, they’re saving the world from Trump, and they look at this and it just doesn’t compute. But this notion of class consciousness and the lack of it? This explains media attitudes in many, many ways that people don’t stop to think of, and I’m talking specifically about the fact that they think they are in the club. They don’t think that they are used. They believe that the friendship extended to them by leaders — political leaders, world leaders, CEO leaders — is genuine and personal. It’s not. They are the media. They are not considered to be in the same class — socioeconomic, cultural, you name it. 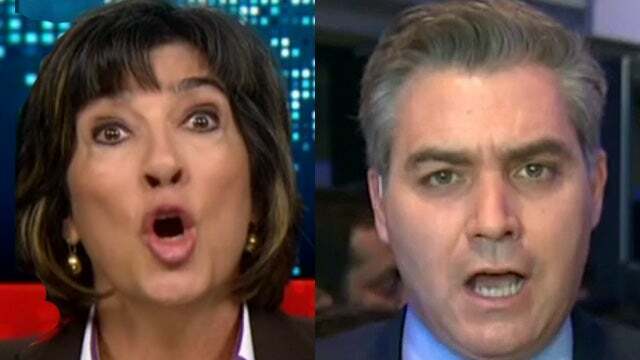 And any time something happens to remind them of that, which Trump’s visit did, then you get the reaction that we got from Acosta. Here, grab the sound bite No. 4 if you didn’t hear it the first time. The second half of it, it’s only 30 seconds, the second half of this is what I’m referring to. AMANPOUR: We have never, ever, ever seen — and we’ve been covering Davos for years — a trumpet orchestra, a trumpet ovation opening the speech of any leader, even the president of the United States. And obviously President Trump is the first since Clinton back in 2000. But nonetheless, that never happened before. There’s no doubt that the Davos crowd loves the corporate tax cuts, loves the stock market, loves the fact that the economy’s doing well. Most will say that the U.S. economy is building on the Obama years, building out of where it was going since the financial crash. But nonetheless, they love the economy and the facts and figures. RUSH: So what Acosta thinks is that the people at the World Economic Forum are gonna be thanking him and welcoming him to the club because he’s trying to save the world from Trump. They think that he and his journalism buddies are gonna be really appreciated and really thanked and filled with the gratitude — and he can’t believe, he can’t believe that this guy is joining Trump in criticizing the media. I’m telling you, it is a personal, personal letdown, ’cause these people live in a fantasy world where they are as important if not more so than the people they cover. And in addition, they think they’re better. They’re permitted to sit there in moral judgment of everybody else, but you can’t do individualism on them. They can do journalism — which is character assassination and all that. They can do that on you all day long, but you can’t do that to them. They are immune. That’s how important and above everybody else (in their minds) they are.